Back in January, I made a lengthy post with regards to fixing how players are selected for the annual festivities to end the first half of the season — the NBA All-Star Weekend. I suggested that only players from teams that are in the top 8 of their respective conferences by the end of January should be selected to join the game. The top team will get 3 all-stars, the 2nd and 3rd best team will get 2 all-stars, while 4th to 8th will have 1 all-star each. Coaches from the worst team in each conference should be the head coach during the game. They’ve been deprived of winning during the long season that it makes perfect sense for them to get their sanity (and a little bit of confidence) back by having superstars to coach even if it was just for one game. Winner of the NBA All-Star game should determine the homecourt advantage of the NBA Finals. This is something that the MLB has implemented way back in 2003. Then-MLB commissioner, Bud Selig, wanted to see the same intensity that he and the fans see all year long instead of making the All-Star game a meaningless exhibition match. The NBA could surely benefit from this, making the All-Star game matter again instead of seeing players playing James Harden-like defense for 48 minutes and shooting Stephen Curry-range 3s all the time. Imagine that — a loaded roster competing to have their conference host the pivotal Game 1 of the NBA Finals while being led by coaches who are trying to cling to their jobs midway through the season. Now that’s a game I’ll definitely watch! 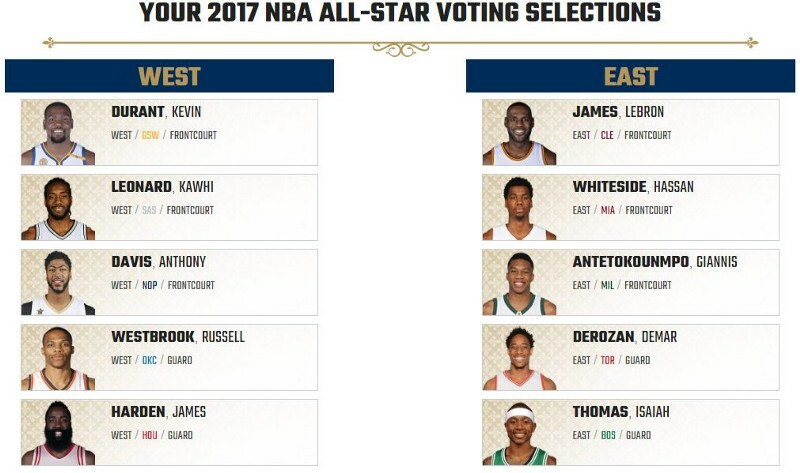 Last week, the NBA announced a major change to revamp the old voting system for the upcoming NBA All-Star game to be held in New Orleans. In the new set-up, votes from fans still matter, but not as much as before. It’s very important to note though that both players and members from the media aren’t simply just voting who should start in the All-Star game; they are also voting for which players should or shouldn’t get a big pay raise in their next contract. This is where the “designated player extension” clause from the recently agreed collective bargaining agreement is affected by the “major change” in All-Star voting. The collective bargaining agreement is a contract between the NBA (commissioner and 30 team owners) and the NBPA (the players union representing, well, the players) that talks about rules made for player contracts, trades, revenue distribution, NBA draft, and salary cap. The “designated player extension” was one of the things agreed upon during the last collective bargaining agreement to help small-market teams retain their star players. The designated player extension (let’s shorten it to DPE, shall we?) rule allow teams to have a designated player and extend him to a 5–year contract extension (previously 4 years) in the final year of their deal, which will keep them on the team for 6 years. If a certain player makes the All-NBA team, or voted in as a starter in the All-Star game, win the MVP or Defensive Player of the Year, he’s eligible to earn 35% of the salary cap in Year 1 of the extension. All six players have either been an All-Star, was part of the All-NBA team, has won DPOY, and even became the MVP in the last 3 seasons. The problem may not be there right now, but both the players and media members could directly influence certain financial incentives for some players who are hoping to get voted in the All-Star game in the future (a player can vote for his teammates or even himself). As fans of the best basketball league in the world, we still have to do our due diligence and vote for the players that we deemed as starters for the All-Star game in February. At the end of the day, the weekend is for the fans, made by the fans even though that it’s only half true now. In the West, it’s tough to pick anyone other than Westbrook and Harden to lead the backcourt. Chris Paul and the Clippers got off to a strong start in the season but couldn’t sustain it due to injuries while back-to-back MVP Stephen Curry has been struggling with his shot as he adjusts to having another superstar in the team. Despite being the sole superstar in their team tasked to create opportunities for his teammates and themselves, Westbrook is averaging (!) a triple double while James Harden is leading the Rockets to the 3rd best record. In the frontcourt, Kawhi is still the 2nd most complete player in the game today (behind LeBron) and has expanded his role as a leader and creator off the dribble now that the mantle has been passed down. Durant is enjoying another highly efficient season and becoming the closer for Golden State. It was a toss-up between DeMarcus Cousins and Anthony Davis, wherein I picked the latter for doing a lot more with a lot less help as he’s leading the league in blocks and just behind Westbrook in the scoring column. Picking the starters for the East was far more intriguing. LeBron is still LeBron, and that alone is enough reason why he should start. I also have Anteto…. I mean, I also the Greek Freak starting in his first All-Star game. It’s tough to catch a Milwaukee Bucks game, but whenever you get a chance, try to watch the Freak glide through the court and go coast to coast in 4 dribbles or less. He is even leading all Eastern Conference players in PER and Expected Wins Added. Hassan Whiteside has been a force for the rebuilding Miami Heat and is fast becoming one of the best centers in the NBA. He is slowly expanding his range, adding 15ft jumpers in his arsenal, while still becoming one of the deadliest shot blockers on the defensive end. DeMar DeRozan is arguably Toronto’s best player and one of the leagues’ top scorers despite not having a consistent 3-point shot yet. Behind James Harden, DeMar may have already eclipsed Klay Thompson as the 2nd best shooting guard in the NBA. And same with Cousins and Davis, the remaining backcourt position was a toss-up between Kyrie Irving and Isaiah Thomas and also chose to pick the latter. The Celtics were missing Horford during the early part of the season due to nagging injuries and it was Isaiah who stepped up (and continues to do so) when Boston need him the most. He sure has responded by averaging 27 points per game, despite his small stature, and continues to attack the lane and draw contact as he’s become one of the more prolific free throw shooters in the league. So there you have it! Now I’m sure you don’t agree with all the selections I’ve made, but that’s the beauty of being basketball fans. We all have different opinions. But one thing is certain, our opinions matter. Even though it’s only half-true now. This entry was posted in Basketball, NBA and tagged Blog, Curry, General Sports, NBA, Sports. Bookmark the permalink.